Lahania lies in the south east coast of Rhodes Island and is far away from and has nothing to do with the hurly burly tourist package destinations. The distance to the city of Rhodes is about 70 kilometers. By car it is about a 1 and half hour drive and by taxi it is about one hour, which would cost about 60 euros. Lahania, like Koskinou, is built on a hill with valleys and a river on the side and mountains at the back. Around Lahania there are beautiful, natural areas, meadows and lots of olive yards. To walk around Lahania is very inspiring and one can feel and breath all the clean air and look at all the beautiful wild vegetation on the sides of the road and in the meadows. Being in Lahania relaxes most people that can appreciate nature, silence and authenticity. The distance to the beach is about 2/3 km. and one can easily walk there since the walk is down hills, but going back is a bit of a heavier walk, which is very doable but only outside the hottest months of July and August. The village Lahania has about 200 houses but only has about 80-90 permanent inhabitants and in the summer this amount can be double. A lot of houses are owned by Greeks from Rhodes who come to spend the weekend and by foreigners who come to spend the holidays and are already for years in Lahania. The Greeks in Lahania are all busy with farming even while having a restaurant or a hotel or shop. In the village itself the houses are mainly restored and whitewashed and looking real picturesque. The streets are all curved and all lead to the heart of the village which is the square with a restaurant and the church. The village and its square are so beautiful that was frequently used as a scenery for some films both Greek and American films (one of which was with Jacqueline Biset). The village on the first sight is nothing special, but one has to get away from the main road leading through the upper part of the village, jump out of his car and continue by foot and stroll through the narrow streets with old, original restored houses and really experience the true Greek feeling. This is after all why people do come to Greece. The village has 2 restaurants with real Greek food and one café/bar, so you have all reasons not to cook at home but just let yourself be spoiled everyday by Chrissys (along the road up at the village) nice diverse cooking or by sitting in a wonderful romantic scenery and eat at the beautiful square with church at restaurant Platanos, and let the geese and ducks pass by. You sit here under the shade of the three hundred year old plane tree while you listen to the sounds of the water coming from the springs and falling in one of the Turkish system of irrigation channels. The children love to play on this square. As soon as one sits down, it is very hard to pull yourself away from the place with its nice and relaxed feeling, and you will soon make it your usual place to sit and watch and drink or eat something. At Chrissys you will find very nice home made cooking. Her husband is the local priest, who used to be a barber back in Baltimore, but now enjoys going on the picture with passing tourist. Do not expect too much if he tells you he will give you a speziale papa yiorgos omelette or coffee. He does it with love though and he is quite funny. At the opposite there is the café Horizon, where one can sit, and chat with the local people and drink a nice suma or refreshing beer. The old building that used to house the local olive press is restored and functions as a cultural center for special events or exhibitions by local artists. It is advisable to rent a car or a motor bike if one stays in the village. There is a bus connection, going to the villages around and going to Rhodes every day (although not more than once of twice per day). Car-stop or hitchhiking is very easy, since everyone understands the necessity of being mobile, but simply the best thing to do is to rent a car, motor bike or bike. Beaches/Coasts - There are several sandy beaches just around and a short drive away from Koskinou, and only just a bit further from Tsaire. Some with pebbles and some rocky ones. Some quiet ones and some busy ones. There are beaches with water sports, diving schools and beach bars. One thing they all have in common: they all have a shower, a restaurant or at least a cantina and above all a crystal clear blue sea. Archeological sites - There are a lot of archaeological scenic sites of interest, but they are not attended commercially and one can find them while driving around slowly and watching the sides of the road carefully. There are a lot of small signs pointing out the points of interest. 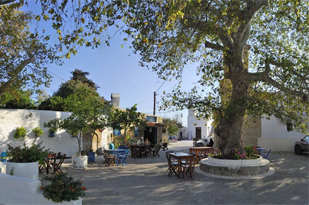 Prasonisi - This is a very special place of interest for kite surfers and wind surfers. People come from all over the world to surf there and it is considered among the best places in the world to kite surf. Last year there have been 115 days of over 4 bft. Rhodes Diagoras airport is appr. 65 km far, and to Rhodes town is about 70km driving. Lindos is about 30 km away.